After more than two weeks of pageant activities, it all boiled into this. 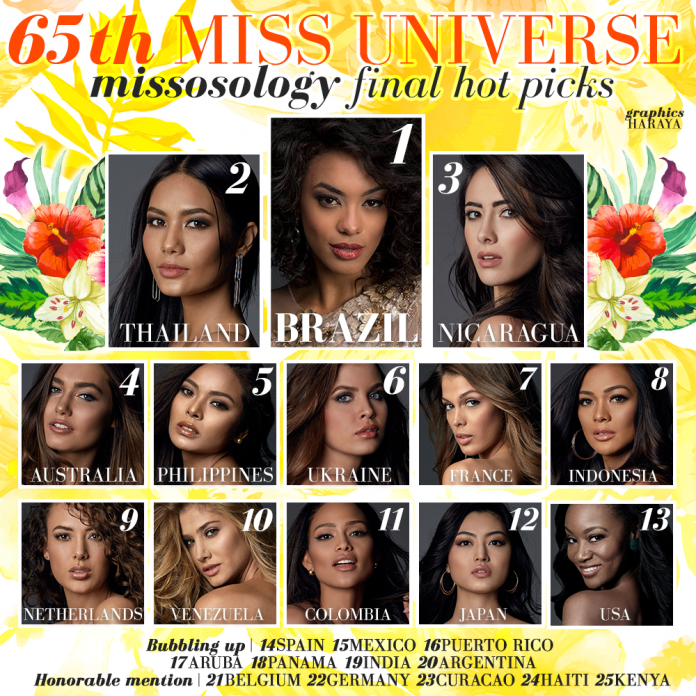 With the conclusion of the preliminary competition and many other factors being considered, the members of the Missosology administration, together with the collective votes of the pageant fans from our official forum, have narrowed down our list into our final hot picks. After the votes were tabulated and further deliberations by our administrators, Missosology has therefore concluded that Miss Brazil, Raissa Santana is the woman to beat at the 65th Annual Miss Universe pageant. Not only did she live up to our expectations, she has also been consistent all throughout the competition. Certainly, there is something unique about Raissa that made us believe that she can best represent the Miss Universe brand name. Some people may not be digging her super curly hair, but with the Miss Universe motto, which is “Confidently Beautiful”, we don’t see any reason why Raissa’s natural curls should be an issue. Truth to be told, she is a gorgeous mulatta with a universal appeal. It is also interesting to note that Angola’s Leila Lopes, who will be sitting as one of the final judges, was crowned in Brazil in 2011, so this factor is vital to make us feel that Raissa could or may just be the “one” groomed to win the title. Aside from the Philippines and USA, Brazil has one of the best records in Miss Universe since 2011, with three straight Top 5 placements from 2011 to 2013, and two successive Top 15 finishes in 2014 and 2015. Following closely at second position is Chalita Suansane of Thailand. Perfectly styled and groomed for the Miss Universe pageant, Chalita’s only weakness is her English speaking skills. However, we believe that she will have an interpreter during the Top 6 question and answer portion, so that should not be a problem. This Thai charmer has been backed up by legions of fans, and is probably the most popular Thai beauty queen in recent years. She registers well on camera, and has a very wholesome look and great stage presence. If not for her distinct Asian look and straight hair, you would have mistaken her for a Latina based on the way she glided on stage. Coming from a humble background, Chalita’s story is one of the most inspiring we have at this year’s Miss Universe. A victory will certainly bring hppe and cheers to her constituents back home who are still mourning for the loss of their beloved king. Meanwhile in third place, we have Marina Jacoby of Nicaragua who, in recent years, is probably the first beauty queen from her country to have moved her nation due to her sudden popularity. Marina was virtually unknown prior to her arrival in Manila. But, when she appeared in the pink Yamamay swimsuit photo shoot, she got noticed right away. During the Filipiniana fashion show, she became an instant favorite. When she guested in a popular TV show, that’s when people became a believer of her. She is an eloquent English speaker. What will prevent Marina from snatching the crown? It is definitely her weak sash. But, we hope that this won’t affect her overall ranking because she deserved to be recognized. Australia‘s Caris Tiivel went up to fourth position. Many had lost their faith on Caris when she did an underwhelming performance during the preliminary competition. But, look at that face! How can someone write that off? Caris is from Perth, Western Australia which is known for their laid back lifestyle despite being a capital city. Caris may seem to be bland for some, but this tall and statuesque beauty queen is actually an artist, which explains her introverted ways. Caris is one of the few delegates whom we could see strutting the Victoria Secret runway in the future. However, she is being advised to change her evening gown for the finals if she wants to stay longer in the competition. Maxine Medina of the Philippines finishes in fifth place in our final hot picks. Despite the heavy pressure, Maxine seems to be totally unaffected and has been a gracious host all throughout the competition. While there are some people who are hoping for a back-to-back victory on home soil, many are a bit speculative about it. Nevertheless, Maxine has represented her country extremely well, and this could be the first time at the Miss Universe stage that we will be hearing a Filipina beauty queen speak in her native language during the final question and answer portion. Completing our Top Six is Alena Spdynyuk of Ukraine. If you may recall, Alena was our No.1 pick in our first ever Miss Universe Hot Picks this year. Her story is one that will make news organizations run after her, should she be crowned Miss Universe. Alena currently lives in Kiev, but she was actually born and raised in Crimea, which is now being annexed by Russia. Beauty-wise, Alena has the classic Eastern European look that was used to be appreciated during the so-called Trump. With Eli Saab being her gown designer, it will be easy for Alena to go further should she survive the first and second cuts. Going now in our seventh to ninth position, we have France as the first in line. Iris was a revelation during the preliminary competition. If there was a “sexiest woman alive” special award that night, she would have gotten it hands down! And for that, she zoomed up into the seventh spot! She certainly knows how to entertain the viewers, and we appreciate the way she played with the audience, especially during the national costume presentation. A stage diva indeed! She is then followed closely by local favorite, Indonesia, who looked stunningly fresh on stage during the preliminary competition. Kezia ended our ranking in eighth position, but if she could pull off a stellar performance in her evening gown, she may give the Philippines and Thailand a run for their money, so they better watch out! Kezia is there to slay! And at ninth position, we have the youthful and uniquely beautiful Miss Netherlands. Zoey was very fluid on stage, and many of you may have recalled that she was one of our pre-arrival favorites. We have no doubts about her intelligence too because she was able to answer sensibly the questions in our beauty talks interview. Surprise, surprise!!! Venezuela went down to tenth position! Performance-wise, Mariam was sassy and fierce on stage. Overly done? We don’t think so! However, if we study carefully her overall performance all throughout the competition, we didn’t see a bubbly and sunny Mariam while on stage. Occasionally, we may have seen her smiling, but she was mostly frowning on stage, which made her look older. If Mariam takes that “Sarah Jessica-Parker look” off, she will easily go further and may take home the eighth crown for Venezuela. Try to look a little bit sweet Mariam! At 11th spot is Colombia, who was another stage performer but sorry to say, she did not live up to the standards set by her two predecessors. Andrea is a wonderful Miss Colombia, but her star did not shine when it was needed the most. Although some have already ceased to believe in her, we cannot writer her off from our final hot picks because, admit it or not, her presence in the Top 13 could spice things up, considering the fact that Steve Harvey is coming back as the host. In 12th position is Miss Japan. In terms of facial beauty, Sari is one of the most beautiful contestants this year. In swimsuit, her petite and lean figure may have looked out of place in a sea of womanly bodies, but her gown performance was memorable. With Mr. Kazuo Okada as one of the biggest sponsors, and the rumored comeback of Mikimoto as a crown provider, what can stop this dentistry student from placing? Riyo Mori was also a preliminary judge. And our additional finalist is none other than, Miss USA!!! Deshauna did an amazing preliminary performance during the Miss USA pageant, but we did not see that same spark and energy at the Miss Universe stage. However, we are positive that her interview scores will pull her scores up despite the mediocre preliminary performance. Spain almost made it into our Top 13. Noelia had a fine performance in the preliminary competition, although a lot were turned off with her 1960s hairstyle. Mexico also did great, but many missosologists expected more from her. It seems that Kristal had nothing more to improve, and they said that they did not see some major transformation since her Miss Earth 2013 stint, which also in the Philippines. We should also keep an eye on Puerto Rico, considering that Dayanara Torres sat as one of the judges. One opinion says that if last year’s Miss Puerto Rico was not able to penetrate the Top 15, who was way prettier and more youthful looking, it just doesn’t seem probable that Brenda could make it either. But, such conclusion could be proven wrong! Aruba also did an amazing stage performance! Charlene’s overall look reminded us of Venus Raj and Leila Lopes. Should the trend return, she can be a shoo-in for the crown! Panama was also memorable, although some pageant observers find her a bit too rehearsed and pageant patty. Keity was a former Miss International 2011 4th Runner-up, who was just appointed to compete at Miss Universe. India should be proud of their delegate this year who was decently good during the preliminary competition. We felt that she lacked self-confidence, but knowing that Sushmita Sen is going to sit as a night in the finals, maybe that could give her some confidence booster, should she place in the Top 13. Argentina had been great all throughout the competition, but her poor gown choice ruined it all. Still, we consider her as one of the most beautiful delegates this year and we can only hope that her scores was not significantly pulled down with that gown. Belgium has always been one of our favorites, and is worthy of a placement. Germany also performed well during the preliminaries and she had lots of fans. Curacao was a revelation with a great catwalk, although she could have gone with a better gown. Haiti was also a standout, and may surprise us all! Kenya, to us, is the strongest African delegate this year and if there is a token placement for an African, it has to be Mary Esther.